GET YOUR FRONT ROW SEAT TO THE BIGGEST GARDENING EVENT IN RICHMOND WITH WEATHER IN THE GARDEN THIS SATURDAY, MARCH 233 STARTING @ 10:00. 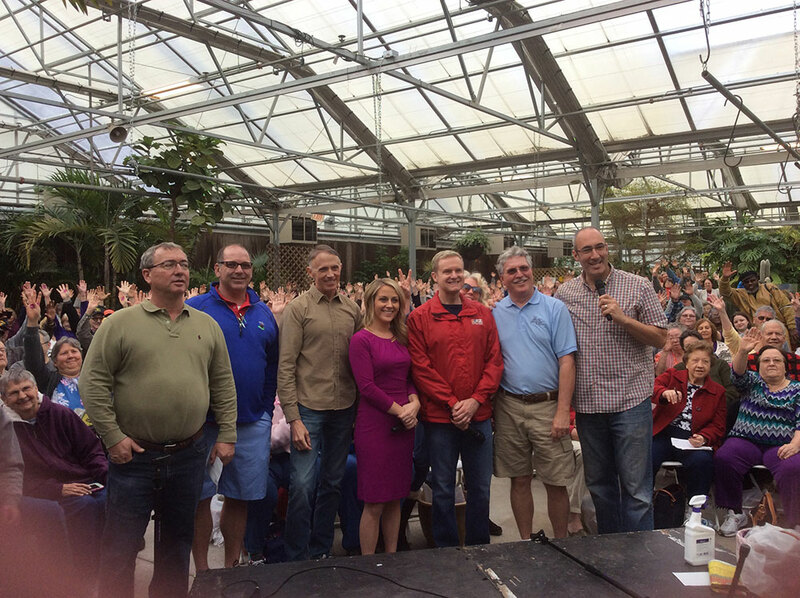 It’s hard to imagine that The Great Big Greenhouse and the NBC 12 Weather Alert Team have been co-hosting this event for 15 years. This all started in 2005. Over the years we’ve learned our lesson and we now organize this event inside the garden center. We have experienced five different times whereby we have had rain at this event. Last year it was sunny but cool with temperatures in the mid-’40s. Our extended forecast is showing a sunny day with temperatures around 65 for the 23rd. If this forecast holds then this would be awesome for everyone attending this event. We will have nearly 400 chairs set up. So, come on and join us and let’s all have fun. With this extended forecast maybe spring is truly here to stay. Let’s all hope so. Rain continues to persist which isn’t all that bad. I am sure you will want to meet Jim, Andrew, Megan, and Nick and ask them about the weather forecast and what we can look forward to as we get ready to go into April. For one, I look forward to what you have to say and ask the weather team. Weather in the Garden is, without a doubt, the premier gardening event in the Richmond area. We are so proud of our relationship with NBC 12 and providing all of you this unique opportunity to meet the weather experts. To add to the day we will have Chesterfield Master Gardeners here with a plant clinic and helping everyone with plant and gardening questions. Also, we will Girl Scout Troop here selling those famous Girl Scout cookies. And, some of our very own farmer’s market vendors such as Unkol Chuck Brunswick Stew, Phal’s Café with her wonderful Asian dishes, Marty with his Swine Skins, and Sharp Again who will sharpen knives or tools. We have a great day lined up for you. Be sure to arrive early to grab a seat and get one of our free gift bags. During the program, we will conduct a raffle giveaway of some wonderful plants and gardening items. At the end of the program one of you will win a $250.00 gift card from The Great Big Greenhouse & Meadows Farms Nursery. Come say Hi. We’ll see you there!!!! I’m out of town–I hate missing this! Sorry you will miss this great event. But, have fun being out of town. Hope to see you soon now that spring is officially here.